I have long believed that the opening salvo of second-wave feminism was fired in 1960, several years ahead of its time, by Peg Bracken, in The I Hate to Cook Book. Before Betty Friedan—and in a much lighter mood (! )—Bracken blew up the notion of the perky, apron-clad “happy housewife.” Maybe you had to be there, but rest assured, I Hate to Cook provoked a burst of hilarity and relief in those who felt guilty when they were bored by aspects of cooking and housework. You don’t love chopping and mincing and slicing—great! You’d rather be doing something else? It’s OK! True, Bracken tended to include sodium-heavy canned soup in almost every dish, but nobody’s perfect. And with regard to salt along with everything else, concerns about food and fashions in food have changed even more than most other things in my lifetime. I was jolted recently, and slightly unnerved, to find an old-time neighborhood steakhouse closed. No surprise, really: last year the place was nearly empty and the lighting seemed more than usually dim. The waiter confided, sadly, that he wasn’t making enough to cover another year of community college, and even if that remark was designed to increase his tip, it sounded authentic (and it worked). We had already decided not to go there again for the annual trip down memory lane—too depressing, even for a glimpse of 1950s menu and decor—but still it was sort of upsetting to find it gone. All that beef! The worst possible food for the arteries, the colon, and the planet, but who knew? My grandmother prescribed “a bit of beefsteak” for anyone who was “run down.” Middle-class households ate meat, or fish once a week, every night before and long after World War II; that’s why wartime “meatless days” and their odd menus were such a big deal. One especially odd “meatless” dinner in our house was known as “PM” because the recipe came from the 1940’s left-leaning New York City newspaper of the same name. 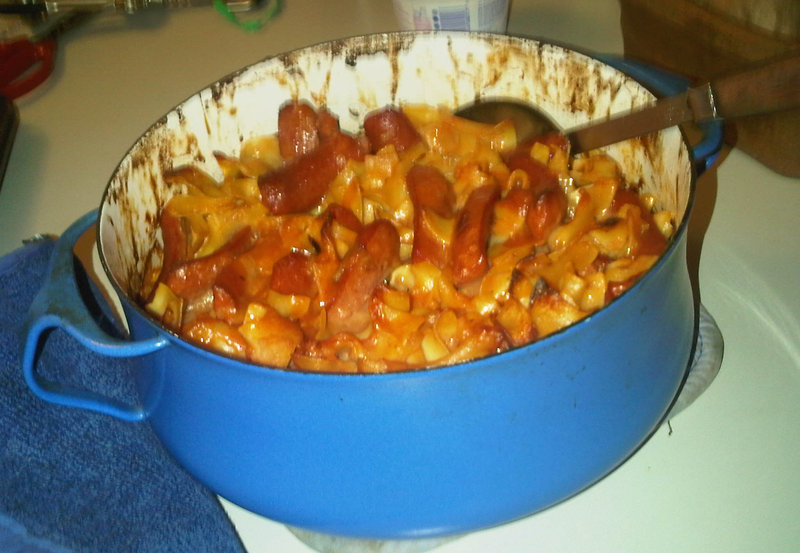 It featured noodles, Campbell’s tomato soup, onions, Worcestershire sauce, cheddar cheese, and—of all things—hot dogs. Guess they didn’t count as meat. I made PM for my own children in the 60s and 70s, not a bit concerned about sodium, and we all sort of liked it, I think. (I’m sure they will feel free to comment, below, if they didn’t.) However, I would not dream of serving it to my grandchildren. I grew up before most Americans were aware of pesto or pasta, cholesterol or toxic pesticides. There was no such thing as diet soda, and—wait for this!—no plastic bottles to clog up the landfills and the oceans. Frozen food appeared in the 1950s; Peg Bracken herself became the TV spokesperson for Birds Eye in the 60s and 70s. Frozen vegetables and frozen orange juice were much better than the canned versions, but what I don’t remember is why that meant we were unable to use the real things, when available. It’s possible that broccoli and Brussels sprouts were not flown around the country and the world to the extent they are now, but I think they were generally accessible in the 1960s. I have discovered, to my surprise, that they are not only better fresh, but no more difficult to prepare—although I feel I should apologize to Peg Bracken for saying so. Bracken died in 2007, when The I Hate to Cook Book was out of print; in her witty and delightful New York Times obituary, Margalit Fox calls its disappearance a casualty of the “Age of Arugula.” (Good news: it has reappeared in a 50th Anniversary Edition.) Fox was right about Bracken’s place in proto-feminism, and she was right about the Age of Arugula. My elder daughter is a fabulous cook and works in a variety of sustainable agriculture and locavore undertakings. Two of my four grandchildren are vegetarians: one announced at the age of four that she loved animals and didn’t want to eat them, and she never has. The third is a near-vegetarian and an excellent cook, like her mother, and the fourth makes Key Lime pie from scratch. None of them would know what to do with a can of Campbell’s cream of mushroom soup, unless it was one element in a still life. Most of the time, I recognize and appreciate how much things have improved. 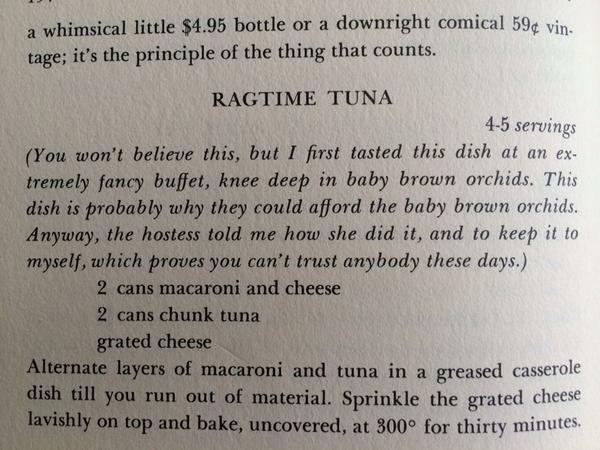 I don’t really want to make Bracken’s “Ragtime Tuna,” but on occasion, as I make my way through the vegan, organic, gluten-free, low-fat, low-sugar aisles of the supermarket, I yearn for a simpler, funnier time, and I wish Peg Bracken were there to pitch cans of soup into her cart and exit, laughing. Not sure how I ended up on your blog, but here I am and enjoying your humour and research very much. Good to hear your voice. I remember being given a copy of Peg’s book in about 1968 by a fellow I knew who was at that time in the process of extricating himself from a Dominican seminary. My lack of interest in all things domestic had touched his heart evidently. I remember being shyly proud of owning a book with such a bold title, which suited me so perfectly. Someone had dared to write what I thought. It’s quite possible I still have it – somewhere! My mum was always interested in what was then called “health food”. In 1950s Toronto, when I was growing up, you could only acquire these vile-tasting substances in one store, called McMillan’s, in the Yorkville area., later the hub of local ‘hippie” culture and now of luxury shops and condos frequented by Film Festival types. We would regularly have to make the journey downtown to this store. Everything was packaged in simple bags. They sold only the basic ingredients – millet, rye berries, lentils, etc. None of the corporate packagers had yet been created except for a few medicinal herbal concoctions imported from Europe..
Mrs McMillan was always perfectly turned out, with never a hair out of place or an ounce overweight or errantly distributed. I rebelled with all my might against such dreary dishes as “millet pudding”, which I can still taste. Its only redeeming feature was the permitted addition of maple syrup to help it go down. Time passed. Mum is now almost 95 and rejoices in the wide variety of organics available in the vast “natural” food store near her, where she typically spends 2 hours on a shopping trip, reading all the labels before buying in order to edit out the “organic” sugar. A few years ago, she was checking out her purchases at said store. They were not busy and the cashiers were chatting. Mum was aware of them looking her up and down. It was “Seniors Day”. She asked for the Seniors Discount. The cashier was hesitant, saying “we wondered if you qualified”. Mum was 89 at the time, and quickly retorted, “I think when you’re pushing 90, you qualify.” The cashiers were stunned, gathered round and asked if this was really true, and what was her secret of youthfulness. It is probably not true of all who endured this kind of regime, but everyone in that household has lived to a ripe old age, with or without war injuries. Just as you have noted with your efforts to free the Rosenbergs, there are always outlier stories which prove that the “norm” was not universal – as I’m sure you know very well. I have the image of Mrs McMillan and the lingering taste of millet pudding to remind me of this! – and a mother who continues to amaze. Mum now has the assistance of a pacemaker. At a recent visit to the Pacemaker Clinic, she signed in and waited to be called. And waited. And waited. Finally, she went up to the desk to inquire. “Oh!”, the clerk said in surprise. “We thought you were waiting for your mother to arrive.” I couldn’t make this up if I wanted to! the book. My favourite Birdseye product was the frozen mixed fruit, if anyone remembers that. Thank you, especially for the memories of the earlier versions of organic food! Clarissa, loved this post. My mother was a world-class cook with a great sense of humor. She had all of Peg Bracken’s books, but strictly for the humor, not the recipes! I arrived home this evening to a nice smell coming from the oven. I had visions of barbecued, pulled pork or chicken or some such thing. 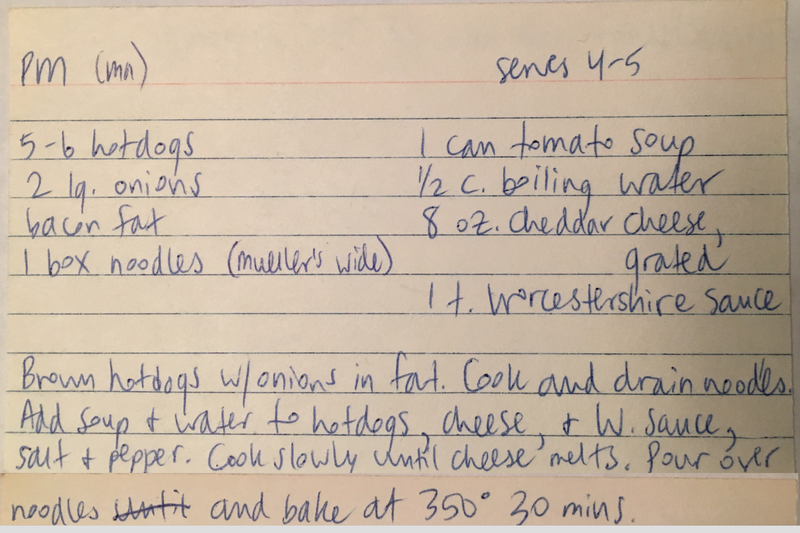 I asked Dad what was cooking and he said, “It’s a surprise.” And it would have been but for the recipe he left out on the counter in Holley’s familiar scrawl. I should have known it was coming because he told me yesterday that “Mom has a new post on her blog! It’s about PM!”. I always found PM tolerable. Hot dogs and noodles and tomato soup: no problem. It was the big, wide loops of sliced onion that I had to leave behind. To be fair, I wouldn’t eat onions in any form back then. But since I have learned to love onions I have also learned that I prefer them diced or Julienned and that finesse goes a long way in making food great. But PM never really had a chance anyway, let’s face it. Tolerable. Intolerable for some. Once after eating PM for dinner at a family gathering (aunts, uncles, cousins) in Connecticut my Uncle Bud took some of the group to a steakhouse the next day to get some “AM”. I assume he felt quite a bit better after that. It’s worth mentioning that my FAVORITE meal during that part of my childhood was “tuna fish and rice” which also required a can of Campbell’s soup, mushroom, in this case. White rice, tuna, mushroom soup and lots of black pepper. Yummy. I think the last time I had it was on my 22nd or 23rd birthday when I was in Boston at school and Mom invited me for a birthday dinner in Cambridge and told me I could have anything I wanted. I chose that. It was good but somehow not quite what I remembered. But a fine birthday none-the-less. Thanks, Mom. Any time – just let me know when you’re coming, and I’ll open the cans. . .
From my years as a bookseller, I know that the I Hate to Cook Book was brought back into print intermittently over the decades — I always, always, ordered it for the store when I could! My impression/understanding of the frozen/canned/fresh debate of the mid-20th century — which may be flawed, it’s not like I was there — is that there was a kind of social status element involved. Having the latest frozen foods would mean that you had an electric freezer that was reliable, not just an old icebox. One thing Peg was right on about: onion soup mix is useful. Because I *am* a jerk about soup mixes, I use dried onions instead, but boy howdy do I use the hell out of them. Yes, Nancy Phillips, SOME ONE, I, am occasionally nostalgic for iceberg lettuce especially when one’s portion, an entire quarter of the head, whose wonderfully convoluted, brutally severed flesh, was heavily doused with a gush of garish salad dressing. In those days I was never badgered to drink eight glasses of water a day. Was there a connection to my consumption of the crisp iceberg lettuce, each bite of which was immediately rendered liquid, strongly resembling water? Can’t wait to make PM this week for Match and me! Bacon fat? For sauteeing the onions? You have to saute (or in this case, perhaps fry) the hot dogs, too. . . I hold that iceberg lettuce is unfairly disparaged, and that it is a totally valid kind of lettuce to eat, just not in all applications. Among other things, it is just the thing on a hot summer day — all that crunch! — and then it can surprise you. For example, I learned from a guy who has a Korean food cart, it’s INCREDIBLY good shredded up and stir-fried in sesame oil with sliced garlic. I’m not saying it should be the only lettuce ever served — which is seems was once the case in the US — but I think the anti-iceberg snobbery encouraged by food magazines and such is just silly. It I will sing the praises of iceberg lettuce as long as I’m running the kitchen here, whether it’s fashionable or not. Until I read this, it hadn’t occurred to me to long for the less serious, less self-conscious, less moralistic diets and attitudes of the last century–but now that I think about it, I do! Wouldn’t it be lovely to stroll mindlessly through the grocery store, not worried that some high-fat, heart-clogging item was going to leap into my cart?Wouldn’t it be nice to have a big piece of chocolate cake for lunch (as I used to do when my kids were little and I decided I needed the energy, and the entertainment)? And as for cooking and cleaning and watching 9 years olds play soccer on a windy field in early April–oy. I’m glad to have a new feminist to celebrate–Peg Bracken, the kitchen liberator. It’s amazing how much information and reflection Crissy Atkinson packs into these seemingly casual pieces. As always, warm and witty. Thank you for taking us back. We ate similar dishes. Wouldn’t touch them now. What a difference. Thanks for this funny and warm look back at our former food-selves. I too was the recipient of some casseroles at my Mother’s hands that by today’s standards would border on child abuse. And yet, I survived and so did all my sisters, and not a diabetic among us. (yet) I still dream of the one with hamburger, american cheese and canned baked beans…. Our friend Paul Shuman, a chemist (Princeton U., 1950s), worked in the Campbell Soup Company Flavor Lab, Camden, NJ. for thirty years. Part of his job was to find chemical substitutes for natural flavors. On his team were two chefs from France. My wife had a canned tuna and cream of mushroom recipe, but she was working full time then. You have such a great perspective. NB as I recall PM was often served with two boxes of Birds Eye Frozen Spinach, or more likely the cheaper local supermarket brand of same. Somehow I knew you would feel free to comment!